The Rapid was built in 1826 by Frederick Preston at Southtown, Great Yarmouth. It was rigged as a brig, with two masts and was 23.3 metres long. During its early years, the Rapid made many trading voyages from Britain to the Mediterranean Sea, reaching the ports of Gibraltar, Malta, Messina, Trieste, Zante, Constantinople, and even Odessa. In 1836 it was purchased by the Colonization Commissioners to use as a surveying vessel. It would be used to explore in detail, chart the coast and waterways of the new province of South Australia and select a site for its port . Despite the Rapid’s name and its figurehead of a racing greyhound, it was not fast. 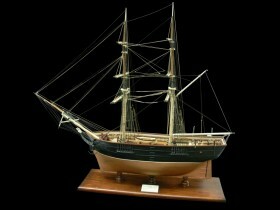 The shape of its hull conformed to the ‘full-built’ model of merchant ships. Its wide shape made it stable and increased its capacity to carry cargo, but reduced its speed. The vessel was placed under the command of Colonel William Light, the Surveyor-General, who had many years experience in the navy as well as the army. Light painted a watercolour of the Rapid straining at its anchors. It shows the main features of the ship including the fixed davits on its quarters to carry survey boats, and the ‘caboose’, or cookhouse, on the deck. The picture also shows that the Rapid was rigged as a ‘snow’ rather than a brig. That means it was given an extra sail, a lower square sail, on the main mast to provide added power. To assist in its survey work the Rapid carried a ‘Government hatchboat’, a small craft that was carried on the deck and was the subject of one of Colonel Light’s drawings while exploring the future Port Adelaide.